There are innumerable writings addressing data center build vs. buy. Unfortunately, service providers with an agenda are producing most of them. Here is some straight talk based upon strategy work with hundreds of data center owners. In this multi-part series, I will first address perspective on the subject and initial actions that should be taken. Time is a commodity that is increasingly less available. If you have been assigned the task of analyzing the merits of build vs. buy, most likely you have not been given a reprieve of your current responsibilities. Working efficiently will save you dozens to hundreds of hours depending on the size of your project. First, let’s consider certainties as pertains to this endeavor. I refer to them as Davies Dictums. Every organization has different priorities and they change over time as a function of various aspects including board/executive concerns, business focus, and competitive conditions. Organizations have different opinions and financial thresholds involving Capex and Opex. So it is logical that no one solution is best. Things change on the supplier side as well. Space availability changes as contracts are signed and lapse. Think of purchasing colo space somewhat like airline seats. The rate that you expected or were quoted months ago may not be valid and this is certainly understandable. 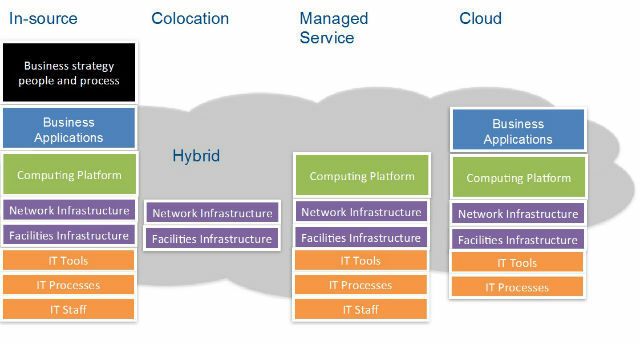 Many providers are offering a wider variety of services graying the lines between colo, managed services, and cloud. On top of this, providers are buying others or re-aligning their portfolios. We have capex to invest Are there better uses? Plant, equipment, IT infrastructure? My costs will be less than theirs Sometimes not all costs are included in your analysis. e.g. real estate, maintenance, licensing, communications, taxes, etc. I have operations and technical staff 3rd party may have more proficiency and technical expertise that you can “rent” to augment your staff or provide staff redundancy. Let’s say your SharePoint person leaves. What matters is what matters to your organization. While this statement seems obvious, I have found many organizations get caught up in the arms race of features/services amongst providers. If the feature set does not impact your organization today, or possibly in the future, then it should neither favor nor detract from your ranking of that service provider. Forget it and move on. Providers also fall into this trap by blasting out features before discovering what matters to the organization. Executive/board preferences eliminate the option you have been pursuing. Float trial balloons early and get a coach who has access to the C-suite. Technical limitations (such as application latency). Have the appropriate SMEs involved in creating the solution. Financial implications that are not defined early. Submit preliminary budgeting to ensure that your request is financially viable. And remember the situational dictum – what was once acceptable may no longer be. This dictum applies to providers as well. While hard to stomach, if you know that a provider(s) is not a fit, best to let them know early. It is unproductive for you and the provider to continue the conversation. I have found retail colos trying to be included in a wholesale colo RFP. Like taking off a Band-Aid, doing it right will hurt at first. Your team will have to be aligned regarding what services you will consider procuring. Are you considering colocation only? Managed services? Cloud? Maybe a combination (hybrid)? Finalizing on a requirement will simplify your criteria. As you consider how best to meet your needs, you will may come to the conclusion that one size does not fit all. You may need to consider various services that require more than one provider. This activity will consequently inform from whom you will eventually solicit RFPs. What are You Currently Spending? Utility – electricity, water, etc. Request someone from Finance participate in this analysis. That person knows how to assemble a business case specific to your organization, from where to get the data, and how it should be presented to executives. The term of your analysis will be a function of your business needs but should typically be 10 years for a colo and two or three 3-year terms for a managed service provider. You will have to take into account replacement of assets at your data center if any are approaching end of life. What are Your Capacity Requirements? You will need to build a multi-year model reflecting how much infrastructure will be required to support your requirements. Typically you will need to provide quantity of racks (or rack equivalent units- REUs) and power consumption per rack. The provider will want to know the maximum power requirement for a rack. Consider providing some level of detail such as a kW value and quantity for server, storage, and communications racks. Assign a growth factor and include a density factor as that will likely increase over time. Get your SMEs involved in this exercise. They should be held accountable making the model reflect reality. While it is impossible to predict the future, state all of your assumptions to provide an audit trail in the future. The key thing to remember is that this is a model to enable comparative decision-making. The model will also apply to the option of building a new data center or expanding an existing one. In Part II, we will discuss the merits of a two-step solicitation process, namely starting with a RFI and subsequently issuing an RFP.